Authorities have said the deadly Milford crash occurred when the vehicle portrayed in the photographs began driving in a very erratic manner. As the driver was allegedly operating the motor vehicle erratically, the car managed to flip over onto its roof and then suddenly burst into flames. 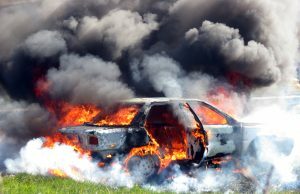 This deadly car accident occurred in front of a car dealership, and workers at the business ran out to the road and tried to help the driver, who was the sole occupant of the flaming vehicle. Unfortunately, the flames had spread so quickly that there was no way to save the driver, and he was killed as police and rescue workers were arriving on the scene. It has not yet been determined if he died in the crash or was burned by the flames, but an autopsy will be performed to determine the exact cause of death, as is standard protocol in this types of cases where there is a question as to the cause of death. They will also likely do a complete toxicology panel to see if intoxication played a role in the erratic driving. However, it should be noted that, as of this time, there were no reports that the driver was drinking or using drugs at the time of his tragic death. In accidents where the police are not sure as to the cause, they will conduct a full investigation. This may include talking to and interviewing any witnesses to the accident and checking for any surveillance or traffic camera footage that may have captured the accident on video. These days, you will likely notice a series of cameras on just about every intersection. These are generally not red light cameras, but traffic cameras that can be used by traffic reporters and also to help police locate a suspect. While many TV shows would lead us to believe that local police can immediately access any feed in the city and combine that with sophisticated facial recognition software, things in the real world are not that advanced. This technology may exist, but it is not in the hands of every local police force in the country. For this reason, the police will likely have to request footage from certain camera feeds and wait to get it. What’s more important for your Boston car accident claim is that, if it is not preserved by local police, your footage may be erased in an effort to save data storage costs, which has been an increasing concern in our era of “big data.” For this reason, you should speak with an experienced Boston car accident lawyer as soon as possible to make sure that his or her car accident investigator can get started on the investigation as soon as possible and preserve any needed evidence.